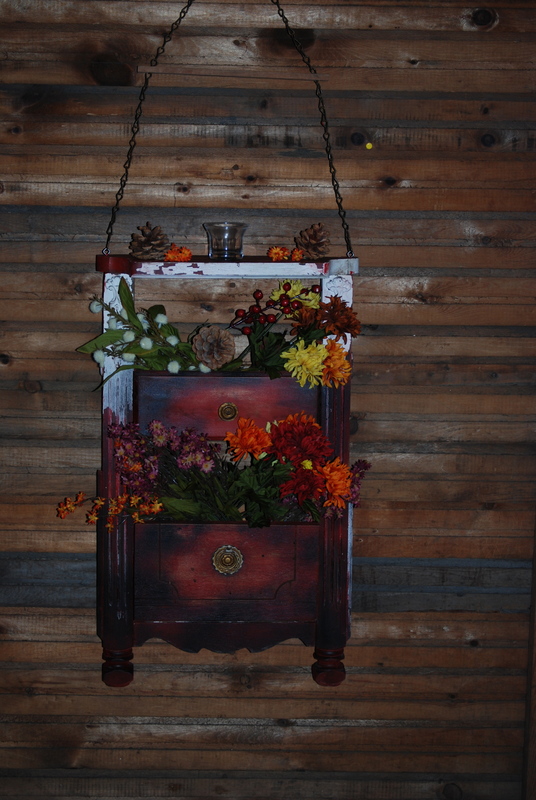 Here’s some pics of the flower hanger I made from a old night stand I had found on garbage day. i think it turned out pretty well. I had this laying around for sometime and was cleaning up one day when I decided to make something of it. My original plan was to sandit all down repair what ever needed to be fixed and then refinish it. I started into it and realized it was not to be saved. Well you can save anything if you really want to but I didn’t want to put all the necessary time into it. So I ripped it down and made this. I took all the sides and trashed them. They were in really rough shape.It had been in a flood and there was no saving them. Well the top was not that bad and I still have that for some other project some day. 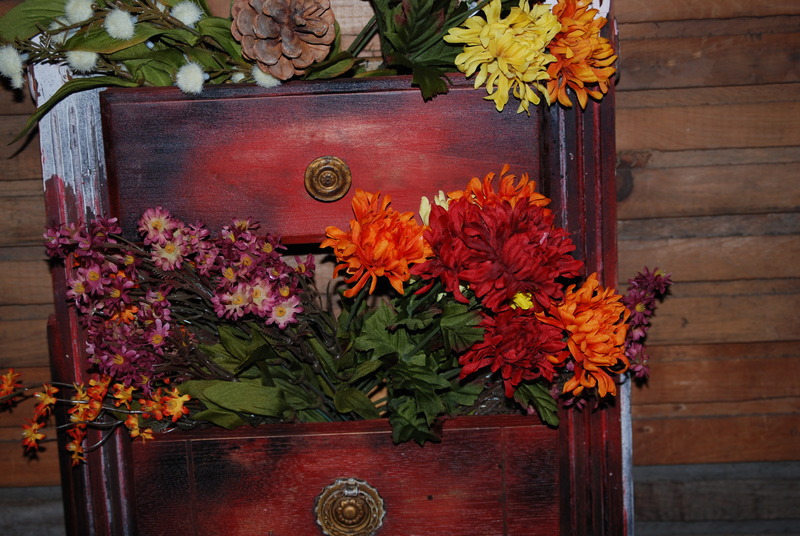 So That left me with the drawers and some corner posts and this is what I came up with! I had been kicking around other ideas and this one just happened while I was working on it. I was originally going to make a letter holder that my wife has been wanting but this seemed to big. I then sanded it to better reflect my color scheme and went to town with some paint. I like it a lot for what I had to work with. 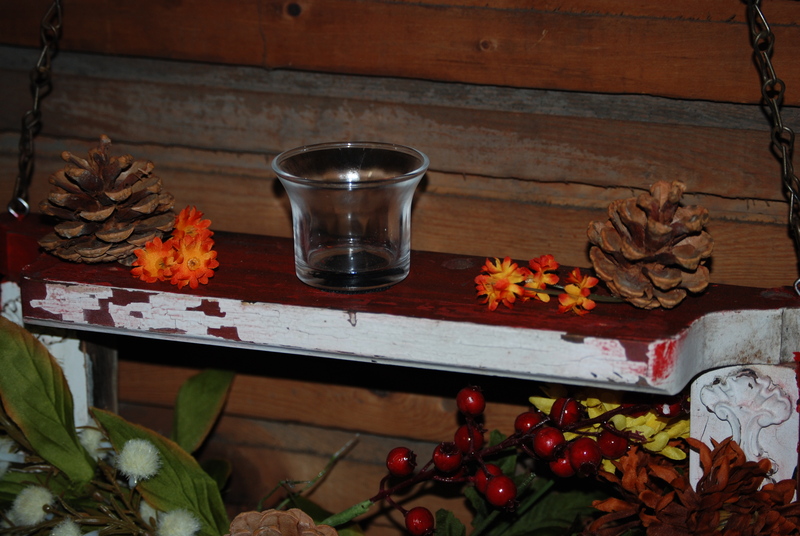 I then went to Michael’s and got some fall like fake flowers and put a small candle on top to make it look somewhat better. I think that it is ok really because my wife usually will say she likes it and thats it if she really doesn’t. That is what happened here. If she does really like it she will try to use it. It is still in the basement waiting to be used some how! I will prolly hang it outside somewhere! Thanks arjun. by the way i love your photos! Previous Previous post: Found a bunch of Woodworking Mags!